Do you know what you’re doing for New Year’s yet? We do. We’re staying in. We have quite a history with this certain celebratory day. Occasionally, we’ve had the best time ever (like the year we went to Lost River Modern!) but the others times we’ve either been sick, had plans rearranged last minute, or just felt completely uninspired by the idea of going out. If we had to pick a New Year’s Eve tradition, one that we’d finally felt strongly about, it would without a doubt be staying in. For a few years when we stayed at home and had friends over, we made fondue. That was a total blast, and it got me to thinking about other ways to ring in the New Year at home, that aren’t necessarily a lot of work, but feel so decadent while being able to stay comfy and cozy at home, not worried about surge pricing for your Uber at 2 AM. We partnered with Cémoi, a sustainable french chocolatier, to bring this pairing post to life. This collaboration could not come at a better time, as this has been my year of beginning to learn and appreciate more about tasting notes apart from alcohol, mainly in chocolate and coffee. As we look to be mindful in the collaborations we choose to work on and support, Cémoi stood out to me not only because of how high quality, and nuanced their chocolate tastes, but once I learned about their process, and commitment to sustainability at every stage of the supply chain I knew it was a brand we would 100% be on board with supporting. The French savoir-faire, combined with cacao terroir is what creates such a rich and dynamic experience, and made the chocolate perfect for this natural wine pairing. Now, for that wine part I’ve been hinting at. A lot of people are really into Pét-Nat right now, us included. It’s a naturally sparkling wine that is made by taking still-fermenting wine and bottling it (sealing with a cap) and allowing to complete fermentation in bottle. We chose it because its delicious, and funky. It’s a little unpolished, with slight bubbles that help lighten and offset the weight of it, once paired with the chocolate. It’s low in alcohol, so you may not be feeling your usual bubbly giddiness right away, making it perfect for sipping your way through a range of chocolates. I’m going to voluntarily put myself on blast for a moment, and admit that I actually love milk chocolate, but find that most of it just doesn’t taste that high quality. Cémoi’s 50% bean-to-bar chocolate from Equador tastes incredibly rich, has woody aromatic notes that for me, and when paired with the Pét-Nat made for a really luxurious experience. Another stand-out for us is the Sao Tomé bar, and Ivory Coast bar. Whether you’re staying in this year, or dancing the night away, wherever you are when the ball drops, we hope you are having the best time ringing in the New Year. 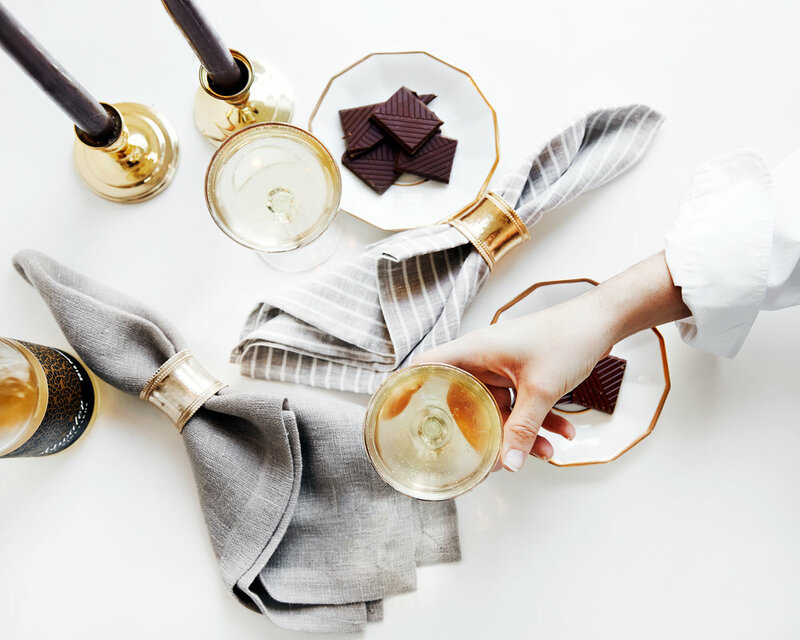 If you’re staying in like us, we hope you find some inspiration from this pairing! thank you for supporting the brands that support Better Happier!